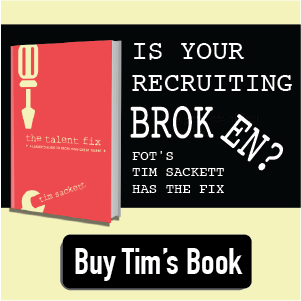 In a Recruiting Slump? Get Yourself Some Warrior Mindset Juice! In the Special Operations world of the U.S. Military, the “Warrior Mindset” is highly revered. Put simply, being able to talk the talk isn’t enough – you have to walk the walk. Throughout the indoctrination process, regardless of what military service we’re evaluating, the goal is to weed out the Wolves from the ‘Sheep in Wolves’ Clothing’. 1. He who dares, wins. Recruiting Translation: Following the crowd might be the safe way to play the game; maybe it keeps everything copacetic and earns you a “don’t rock the boat category” badge for your sash or blue vest. However, let’s be honest: Nobody achieved anything great by simply moving lockstep with the crowd of sheep. Embrace your inner wolf, break from the zombie-like masses, and don’t be afraid to make an “All-In” bet. Bonus Translation: Don’t assume “Best Practices” to be the golden chalice they’re often marketed as. If “daring” means embracing your inner critical thinking ability and not accepting PowerPoint bullet-points at face value, then dare away. 2. Avoid the path most easily traveled. Recruiting Translation: If your Competitors are advertising their jobs, have a Twitter account, and Facebook fan page, etc., simply achieving parity isn’t enough. Sure, it’s important, yet reaching parity is the path most easily traveled. Instead, push the envelope – get into the weeds and start working the phones. Phone work and direct candidate contact is the toughest path, so learn to love this fight. Further, nothing is more guerrilla-centric and Warrior-like than phone work, so embrace it while your Competitors take the easy street of relying on a Social Media presence and series of Job Board advertisements to recruit for them. You’ll know you set up a successful ambush when you begin hiring more top talent in less time at a higher close rate, while the Competition is whistling away on the road to mediocrity and wasted staffing-spend. 3. In order to accomplish the mission, you might just have to get a little bloody/dirty. Recruiting Translation: When it comes to a req that is mission critical to your organization, you might have to lay it all on the line. It might take 100 calls to the West Coast from 9pm EST to 12am EST. It might take 25 “No’s” before you get your “Yes”. It might take Tivo’ing the season finale of ‘Dancing with the Stars’ or missing Wednesday night Bingo Bonanza at the local Boy’s Club. Get over it. The difference between a Wolf and a Sheep is that a Wolf understands that risk and sacrifice are both essential to achieving anything worthwhile. Recruiting Translation: Show me a mission that is going perfectly according to plan… and I’ll show you an ambush about to happen. Sure, failing to plan is planning to fail, but be flexible. When the proverbial crap hits the fan, adapt your plan to meet the challenges you’re facing. When all the variables shift, keep ‘Mission Accomplishment’ in mind and improvise where necessary. Most importantly, have the mindset that you will overcome; you will win. To be blunt, don’t fold when Candidates “aren’t calling you back” or when you happen to recognize your comp plan stinks (relative to the Competition). Remember: Adapting, improvising, and overcoming isn’t just about the Talent Pool, it’s also about what you’re doing on the inside of your organization to overcome the challenges you’re facing. If your firm’s strategy or employment product is broken, communicate it and catalyze a solution. 5. Rules are made to be broken. Recruiting Translation: Show me a talent acquisition unit or recruiter who “plays by the rules”, and I’ll show you a sheep (or a group of sheep on their way to slaughter). When it comes to high-performance in the world of recruiting, ‘rules’ are mental constructs that hold us back from not just pushing the envelope, but igniting it into the blaze of flames where it belongs. Now I’m not saying to break any laws or do anything unethical, but I am saying that if you’re a ‘by the book’ thinker, then perhaps you’re in the wrong profession. When your competition is time-blocking their afternoon (i.e. “Sorry, I only interview from 9am to 11am each day”), scrubbing job board databases instead of asking for Referrals, and running out of the building to go home at 5:30pm, don’t play their game. Several other points could easily be included on this initial list, however, this should be enough to be digestible and really get the juices flowing. But let me suggest one thing before you start your weekend – it’s rare to ever meet a truly high-performing recruiter or talent acquisition professional who doesn’t think with the Warrior Mindset. Gladiators may fear their opponent out of respect, but they must believe they can win to get out of the arena alive. It’s like Jack Nicklaus stating that he doesn’t miss 5-foot putts, Kobe Bryant stating he doesn’t miss free-throws, or Albert Pujols saying he doesn’t strike out. It’s the psychology of high-performance; it’s Quantum Physics; it’s the “Secret”. You must believe. The Warrior Mindset is ultimately all about how we deal with adversity. It doesn’t matter how many times we get knocked down; it’s about how many times we get back up and continue pressing forward.